(TORONTO) –From emotionally-charged styling, ample power and performance, fresh standard features and options packages and impressive fuel efficiency, the 2011 Toyota Camry adds up to exceptional value for Canadian drivers; just ask the over 370,000 Camry drivers on the road today. And with six models in the 2011 line-up, featuring a choice of engine sizes and models, there’s a Toyota Camry for everyone. All 2011 Toyota Camry models can accommodate up to five passengers and 15 cubic feet of cargo. The Camry’s front wheel drive configuration enhanced with Vehicle Stability Control and Traction Control deliver driving confidence, making the Camry the perfect mid-size family sedan. Camry LE V6, Camry SE V6 and Camry XLE V6 models feature a muscular yet smooth 3.5L V6 that delivers up to 268 HP/248 lb-ft of torque. Regardless of model, a six-speed automatic Super ECT transmission with overdrive and sequential shift mode delivers smooth, responsive shifts, and impressive fuel efficiency: 7.7L/100KM combined on four-cylinder models, and 8.9L/100KM combined in V6 editions. What’s more, all Camry models deliver Tier 2 Bin 5 emissions performance thanks to Toyota’s advanced engine management technologies, such as Dual Variable Valve Timing with intelligence, Sequential Multiport Electronic Fuel Injection, and an Acoustic Control Induction System. Driving confidence is assured with a suspension system designed to deliver a smooth, responsive ride under a variety of road and weather conditions. 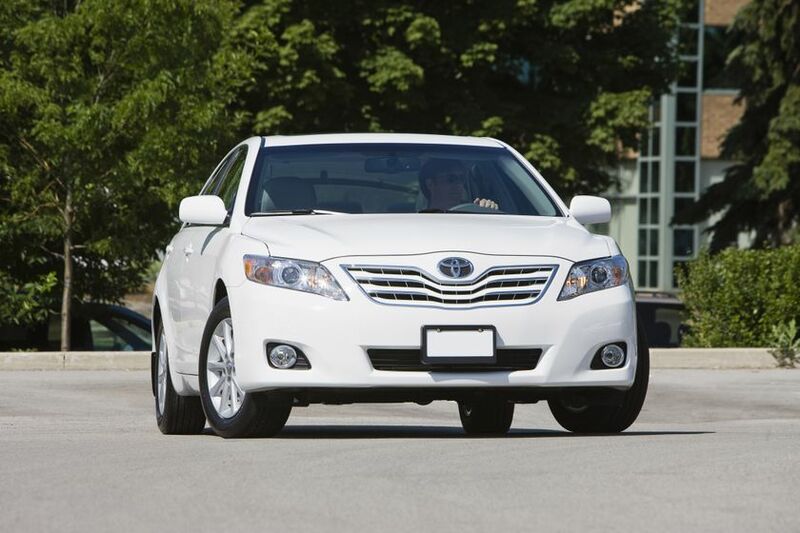 All Camry models feature Macpherson gas struts, dual-link rear suspensions, coil springs and stabilizer bars. Camry SE models have a sport-tuned suspension for a more direct road feel and even better cornering performance. P215/60R16 (LE, XLE) or P215/55R17 (SE) all season radials and a full-size spare tire. The four-cylinder Camry LE is practically equipped with plenty of standard features in addition to those already listed. These include an AM/FM/CD system with MP3/WMA capability, audio auxiliary input jack, and six speakers, plus a 60/40 fold-down rear seat with fold down centre armrest. The Camry LE may be ordered with Toyota’s Convenience Package. Upgraded for the 2011 model year, this package’s new features include Bluetooth capability, a USB audio input, XM Satellite Radio, auto dimming rear view mirror with compass and aluminum alloy wheels. The Camry LE may also be fitted with the Leather Package, which adds heated front seats with high/low settings, leather seat surfaces and simulated leather interior door trim. Sporty yet efficient - that’s the four-cylinder Camry SE. Features unique to the SE include P215/55R17 all season radials on 17” aluminum alloy wheels with locks. Fog lamps, a sport grille, colour-matched full skirting package and rear spoiler combine to give the Camry SE a sporty flair. The sporty theme continues inside, with front sport seats, special sport fabric, aluminum sport pedals with rubber inserts, and more. The Camry SE may be ordered with Toyota’s Leather and Moonroof Package, which adds Bluetooth connectivity, XM Satellite Radio, a USB audio input, heated leather front seats; a power moon roof, and more. Premium features and fuel efficiency go hand in hand in the four-cylinder Camry XLE. From an upgraded audio system to additional standard features, to upscale interior finishes, the Camry XLE moves Canadian families in comfort and style. The Camry XLE’s long list of standard features includes a premium JBL Audio system, an upgraded air conditioning system featuring dual zone automatic climate control and a plasma cluster to reduce airborne germs, an enhanced instrument cluster featuring a multi-information display, power adjustable and heated front seats, leather seat surfaces, rear seat reading lamps, an anti-theft system, a power moonroof, and much more. The Camry XLE may be fitted with Toyota’s Navigation Package, which features a four-disc CD changer, plus a DVD-based navigation system with an integrated back-up camera. Performance and value go hand in hand with the Camry LE V6. For the 2011 model year, Toyota enhances this popular model with several new features as standard, including integrated XM Satellite Radio, a USB audio input and Bluetooth connectivity. The Camry LE V6 may be fitted with Toyota’s Leather Package, which adds heated front seats with two-settings, leather seat surfaces throughout, and simulated leather interior door trim. Sporty performance is front and centre in the Camry SE V6. For the 2011 model year, the sportiest of Camrys comes with additional standard equipment, including integrated XM Satellite Radio, a USB audio input, Bluetooth connectivity, sport leather seats including front-seat heaters with two settings, and the Toyota Smart Key System with Push Button Start. These join the many features unique to the SE, such as P215/55R17 all season radials on 17” aluminum alloy wheels with locks. And of course, the SE V6 gets the same sporty treatment, inside and out, as its four-cylinder cousin, including fog lamps, a sport grille, colour-matched full skirting package, rear spoiler, aluminum sport pedals with rubber inserts, and more. Looking for maximum performance and premium style? The Camry XLE V6 delivers plenty of both. From fog lamps to trunk chrome trim, this model radiates sophistication. Inside, the well-appointed interior features all the appointments of the four-cylinder Camry XLE – including leather seats, a premium JBL audio system, dual zone automatic climate control, and more. The 2011 Toyota Camry is on sale at Toyota Dealers across Canada. The Toyota Camry LE carries a manufacturer’s suggested retail price starting at $25,310 for four-cylinder models, and $29,020 for the Camry LE V6. The Toyota Camry SE starts at a suggested price of $27,755 for four-cylinder models, and $34,255 for the Camry SE V6. The Toyota Camry XLE starts at a suggested price of $31,235 for four-cylinder models, and $36,410 for the Camry XLE V6.